I got to spend a lot of time with my girls today, while Marie and Julie tended the Herbalife table at the convention. At the timeshare I’m staying at, there was plenty going on. Including a live band, face painting, balloon animals, an apple pie eating contest, and a hot dog eating contest. I decided to enter the hot dog eating contest, along with about 15 other people. The challenge was to eat 3 hot dogs the fastest. There was one guy there who ate super fast, and when he finished, the I basically stopped. Then we were told “keep going” so they could declare a 2nd and 3rd place finish. I could have taken 2nd place, but since I stopped, I ended up a tie for third. I don’t believe there were any prizes other than bragging rights, so no big deal. At 7pm, there was a beer tasting event. We got to try 7 different beers. I don’t remember what they were called, but the first one I had was my favorite. I should get the list and see what it was. After the tasting, they had some beer games. We started with a team event of flip cup. (my team lost) Followed by an individual game of flip cup. (I took 4th out of 6). And a team event of baseball (my team won). We found plenty of time to get in the pool. And we got to see some fireworks from our hotel. Today was the first day of the National Federation of the Blind’s 2011 National Convention. It’s the main reason why my family is here. There weren’t many sessions that I cared much about. In fact, the only ones I really cared about were the ones on Android accessibility and iPhone accessibility, and both of those sessions were today. I learned a little bit about the currently accessible apps, and hopefully Marie will give some of them a try. Today, our friend Julie came down. She’s coming to give Marie a hand at her Herbalife table these next two days. Marie can really use the help. In the afternoon, we finally got a chance to hit the pools here at the resort. The water was so warm! One pool had water flying everywhere, and a huge bucket that fills up with water and dumps out. There was also a nice long tube slide in that pool. At the other pool was a big pirate ship. And slides come down off of the pirate ship. And there are water canons shooting all of the place there, too. We stayed at the pool for about 2-3 hours. A very long time. Domino was all over the place. Carolena loved it, too. This evening, Marie had a first-timer’s meeting. The rest of us went out for Chinese. I don’t know what we’re going to do tomorrow. Marie has her Herblife table to tend to nearly all day. I haven’t decided what to do with the girls. I do know that I need to get to the grocery store so I can stop eating out for every meal. That sure gets expensive fast! There was a really cute magic show that we went to this evening. The guy told corny jokes really got the kids going. Domino got to go up on stage and participate in two of the magic tricks, too. After the show, Domino went to Magic Class and got to learn a handful of tricks to show her friends. They were pretty good tricks, too! Maybe if you ask her she’ll show one to you! Today, the family went to the Holy Land Experience. It was, well, Holy. I don’t know that I would recommend it for kids, though. Not any fault of the Holy Land Experience, I guess, but the first thing we did was go to a kid’s show. While waiting, there was a video playing of some kids Christian TV channel. We got to learn about being touched in inappropriate places, and how if somebody touches you in the same place that your bathing suit touches you, that’s bad. But anywhere else – that’s good! Right after that, we got to learn about drugs that are good an bad. In case you didn’t know, cocaine and heroine are bad. “Jesus” then walked in and was a bit surprised himself about what they were showing, turned it off, and said that he “agrees with everything they said.” Was a very strange beginning to the day. At least the kids show was very good. Domino was awesome. She shouted out tons of answers, tons of questions, and really did a great job participating. That was awesome. Later on, we went to see a play. They run plays all day. The one we chose was “Forgiven – Three Biblical Heros restored & redeemed.” Two of the three stories were about women who cheated on their husbands (or men who enticed them to). The first hero was King David, and how he slept with Bathsheba, and then attempted to cover it up. Another hero story was about Josiah. The wife left him, slept around and got pregnant. Then, things got bad for her, and she ended up being sold at an auction as a slave, but her husband found her there and won the auction. I didn’t really like having my kids watch a story about women who cheat on their husbands. The other “highlight” of the day was a re-enactment of Jesus’s death. It was brutally realistic, and as soon as Jesus was put up on the whipping post and beat up, both of my girls freaked out. They cried uncontrollably for the duration of his crucifixion. I was able to give Domino my iPhone and have her focus on watching a movie on there, but Carolena couldn’t be consoled. Definitely not a show for kids. There were a bunch of cool things there. We got to have communion with Jesus. We got to learn about bibles, where they came from, what people went through to create them, and how they got to be what they are today. They had actual relics, original scrolls, and original bibles from a days of old. We’re back at the hotel now. I think there’s a magic show in a half an hour. Hopefully, we’ll get in the pool, too. I can’t wait to take some pictures of the pool. It has to be the coolest water feature of any hotel I have ever stayed at. It’s like being at Sesame Place’s pool. We have arrived at our timeshare. This place looks really nice. The room is only a efficiency, which means there is no private bedroom; it’s basically a very nice hotel room. But it’s a Marriott, and they have plenty of things to do here. I am very happy to find out that there is free Wifi here! 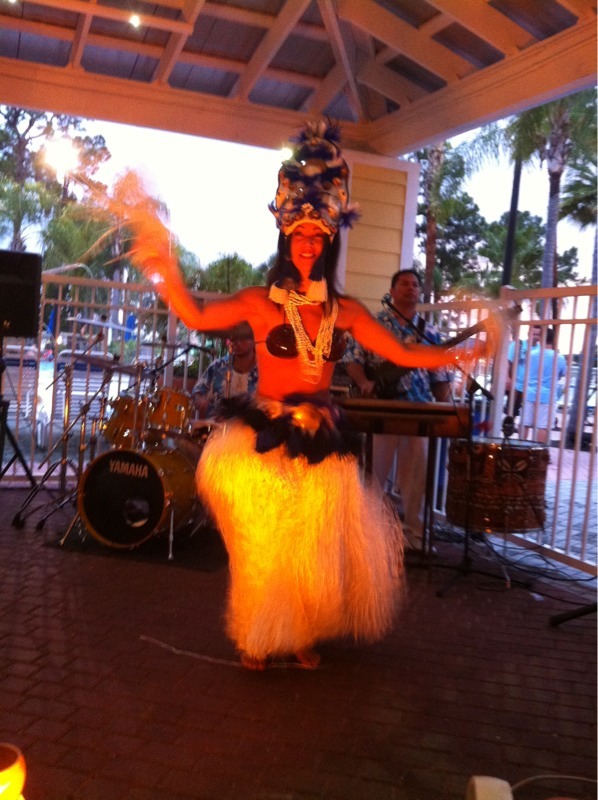 Tonight there is a Royal Polynesian Show. I’m looking forward to it! After the Apple store, we decided to get some lunch. I need to try the iPad version of Square. Maybe it’ll be more accessible than the iPhone app. I doubt it, but who knows? We are at Bahama Breeze for lunch. Should be nice. Unfortunately, my back is killing me. Must have been the way I slept. So we are at the Apple Store to pick up a Bluetooth keyboard for Marie to make it easy for her to accept credit cards using Square. Unfortunately, the Square is completely inaccessible, despite them telling me otherwise while I was at WWDC. I’ll be sending them hate mail later today. One thing I’m very upset about, though, is that the Apple Phone app uses buttons and does not accept keyboard input to dial digits. That would have been a huge help because Marie has trouble using the phone to dial digits quick enough for automated ordering. I’ll be sending Apple some hate mail, too. With those two being the main reason for buying a keyboard, and neither of them working for us, we are not going to buy a keyboard today. Train is about stopped. We will be getting off soon. It just started pouring rain. Gonna be an interesting day. Hopefully it stops soon.